This address is for deliveries only. Talk-based services are by phone or internet conference call and in-person services (autism play therapy and Anat Baniel Method Neuromovement lessons) will be conducted at a mutually agreed-upon location. Welcome to your new and improved life! Power of Clarity LLC and Autism Power Coaches LLC are happy to be your source or self-defining clarity, innovation, resilience, happiness, and generally healthier mind & movement, called "Mind-Movement(TM)". We'll help you feel more accepted, more clear on what you want, and more effective at creating the life that most resonates with you and makes you most happy and energized to be alive. We help people find and then reach higher levels of ability, achievement, and recovery, and potential. Dive in and try our unique services! You're going to wonder what you ever did without us. We're so thrilled you're here! We Offer Life-Changing, Brain-Boosting Services! We help you (or someone you love) break through and break out of long-standing issues, patterns, habits, and limitations by offering new choices that you (or they) don't realize are available, whether in how to move, think, feel, invent or re-invent in their lives. We do so in nonjudgmental, pleasurable, self-affirming ways that stimulate the power of brain change ("neuroplasticity"), making a better life possible through a better (faster, more organized, more self-aware, more interconnected) brain. We can potentially help any one in any way - physical, mental, developmental, or neurological or neuromuscular challenge - because we help the brain that orchestrates most everything that happens, manage better, have more circuits to draw from, and upgrade itself. Do you have something to talk about but noone you think wants to listen to, at least without judgment? We will. Do you want more "aha" moments, sooner, when they would be useful? We help generate "aha" moments. Do you want to raise your level of performance as an athlete, musician, dancer, student, as en entrepreneur, or in your work, and prevent repeat injuries both physical and psychological? We upgrade the brain that orchestrates what you do, and helps you avoid missteps and more quickly recover from bad choices and damage. Have you suddenly realized a way to make something you thought was a bad thing, a good thing and wish you'd figured that out right away so you could feel relief and had gotten going making things work for you, faster? We help you find gifts and opportunities in what appear to be challenges and set-backs! Have you felt stuck, unclear or procrastinating on issues, plans, decisions or projects, and wish you had a way to brainstorm or find more solutions? We enhance your inner conversation and brain chemistry that makes you feel better whether or not you solve those problems, plus makes it more likely you will! Want to take the edge off your anger, frustration, anxiety, or other negative emotions about past, present or future experiences and issues? That's our business! Have you felt whip-sawed by other people's advice and judgments, and are unsure what you own position is on something? Wish you were more clear and solid on your discerning and moving on your own wants, rather than theirs? We help you tune into yourself - listen to your own senses, impulses, body and thoughts - so you can define yourself and the path that best works for you, separate from influences of people that don't feel right to you. Have you ever over-reached or liften something awkwardly and hurt yourself? We help this happen less by improving sensory and body awareness, improve brain mapping and timing, and reducing unnecessary tension and stiffness. Do you want to go back to an earlier, higher level of functioning and find physical therapy or traditional therapies didn't get you there? We take over where traditional medicine, therapies, or mental approaches leave you short at their completion. Whether you're getting inflexible due to age, past injury or health condition, you'd may be surprised how much of it was "in your head" (and changeable)! Have you found traditional coaching or counseling hasn't helped you much in your relationship or career? How could it if it didn't give you more awareness of long-standing patterns and how to change them intentionally through belief change. We provide a non-medical, alternative, self-defining approach: We help people start sensing better, realizing they can control, then owning their reactions rather than blaming others, so they can be more intentional, proactive and feel comfortable changing current patterns. Do you know any autistic people (child or adult) you would love to help recover from autism more fully and/or through an enjoyable process? We get autistic people on board the fun and benefits of interaction and recovery, which makes recovery more fun, effective and more complete. Would you like to help someone autistic have an increasingly better relationship with you, while they increasingly thrive, and live up to a higher potential? We offer coaching that helps strengthen relationships with autistic persons that actually speed their recovery, as well. Do you have detrimental physical or mental habits you'd like to change? We help the brain get used to, better at, and more comfortable with pausing and reversing course as a new ability. You may find compulsions like having to finish your food or finish books once you've started reading them, or get dressed in a certain order, give way spontaneously or with greater ease when intentional, making your life easier, more efficient, and with greater freedom. Why not your bigger habits, too? Would you like to have things to do when lying awake at night that could help you get back to sleep but be useful (and not disruptive to others) until you do? Our eye movements may help you get smarter, see better (since vision is based on muscular factors), and self-explorations will help you find clarity, while quietly tiring out your brain, easing you back to sleep sooner, with improvements upon waking. We can help in these or similar situations, and this list can go on forever (and seems it nearly has!) because there is no parts of YOU which you brain doesn't manage in some way. Try our services to see what could change for you. How and whether an individual changes is unpredictable, but tends in the direction of higher function, which is a pleasure to experience or behold. *In-person sessions booked through this automated system must be at a pre-approved locations less than 2 hours from our zip code 53202, and must include our roundtrip travel time rounded up to the nearest 15 min, when booking. Contact us to pre-approve your location, for information on booking if you are 2 hours from our headquarters at 53202, or need help booking (we can book times for you or guide you through). We regularly visit other areas such as San Francisco, CA, Cleveland, OH, Chicago, IL, etc., email us to let us know where you want lessons and we possibly could arrange a field trip to your area in the US or Canada. We're the very best people to talk to, regardless of what it is that's on your mind! We're provide a nonjudgmental, accepting, nondirective way for you to explore and resolve open issues quicker and with more confidence and comfort, by guiding you toward clarity and spontaneous insight into even long-standing or very difficult problems. We follow you as you explore your issue, then when you pause, ask nonjudgmental questions that help you focus and consider new possibilities that you never imagined were there, even if you rolled the issue over in your head or had "ordinary" conversations a hundred times before with no satisfying progress. Those questions and the absence of judgment spur you to consider fresh new angles, question assumptions you never realized were shaky and/or self-limiting, and result in neuroplasticity and enhanced future insight and flexibility. Negative judgments and unquestioned assumptions are major limitors of our effectiveness, success and happiness by causing neurotoxic/ neurosuppressing brain chemistry and rigidification we help reverse. Take the edge off your anger, fear, and avoidance so you can get unstuck! to, getting decisive about a business project or career change, to dealing more constructively with your family or colleages at work, to getting past experience or fear of future ones that bother you, we're there every step of the way! Our process of helping you focus, nudging you to less judgment and fear, asking questions you've never thought to ask, and asking you to slow down to feel and understand your reactions to things, triggers neuroplasticity. All our convesational services are conducted by people who have been certified as Option Process® Mentor-Counselors. Our autism play therapy is as fun, playful, loving, respectful, nonjudgmental/ accepting as it is highly effective. It's based on elements of the Son-Rise Program, Anat Baniel Method®, and innovative insights specific to Autism Power Coaches LLC, and uses the power of neuroplasticity and genuine oxytocin- and positive-attitude-brain-chemistry-inducing human connection to address the core symptoms and causes of autism. Most other therapies slide around on the surface of autism and never actually help the child with their autism, only coping with the child as is; ours stimulates more natural development and potentially complete recovery, so kids start developing in ways you haven't been "working on". It gets that development engine to start moving again. We're developing a reality show for TV and web about autism called "Autism Commandos" and offer the same play therapy and parental coaching services for free to families who allow us to feature them on the show and/or online educational videos. Contact us if you are interested in participating in the show. All our autism-related play therapy and parental coaching services are delivered by people who have worked with autistic children in a Son-Rise® Program for at least 2 years (in most cases having run a Son-Rise Program for their own child for many times longer) - and have attended all 3 basic Son-Rise training programs. Our coaches are not certified by or affiliated with the Son-Rise® Program itself; they have been selected for their effectiveness and expertise by Autism Power Coaches LLC. Select "Power of Clarity LLC" from the dropdown at the left for all services not related to autism recovery. Select "Autism Power Coaches LLC" for services related to autism. All sessions are subject to Terms and Conditions** - read below before booking. If you need more information before booking, read on. We'll remind you later about booking! Our autism therapy coaches have extensive experience (but are not certified) recovering autistic children and/or adults, typically using the Son-Rise Program in their own homes with their own children. Our talk therapy coaches have been Certified as "Option Process® Mentor-Counselors". Our movement lessons are conducted by Certified Anat Baniel Method® Neuromovement® ("ABMN") practitioners, with Children's Mastery training if working with children. The Companies offer education, alternative care, coaching/self-improvement, and/or bodywork services. The Companies do NOT offer licensed medical, counseling, rehabilitation, or any other government-licensed services and are not a substitute for them (although they can be used in conjunction with other health-related services at the discretion of your licensed health provider). If you are having an emergency or acute injury or condition, contact 9-1-1. If you are under active acute care of a medical professional, you must obtain their agreement with our services before scheduling. The Companies use methods that are gentle and intended to be done within a zone of relative comfort. The Companies make no warranties or guarantees concerning any particular outcome, result, or improvement from participation in any of their services offered, and are not responsible for any direct, indirect, consequential, special or other damages including but not limited to economic loss, injury of illness that may result from the Companies' services. As coaches and consultants we provide the same experiences, suggestions and approaches to all situations; it's up to the customer to decide whether, how and to what extent to move or change mentally or physically during sessions and or at home or work. Even licensed medical providers are held to a standard of process and care, not guaranteeing outcomes, and in that regard we are no different. All sessions are prepaid at the time of scheduling and must be canceled 24 hours or more prior to the scheduled start time in order be refunded, generally less a $15 cancelation fee, which will be waived when a session is moved the same time. Exceptions to this policy in the event of an inavoidable emergency will be reviewed on a case-by-case basis by customer support. Whether involving movement, play therapy or talk, all sessions are designed to feel pleasant (not hurt), and be respectful and move away from things that hurt. Move slowly, do not push yourself past your point of comfort and ease psychologically and physically. Tell your Company coach / service provider if you have any discomfort or other concerns before and during the session to prevent injury. You are able to and requested by The Companies to decline any movements, questions or discussions or questions that don't feel right or safe. Bookings are by default for "private" clients. If you are willing to let footage of our session(s) be released publicly by the Companies as part of making the public aware of The Companies' services and the degree to which they are extremely effective in improving lives, you can sign up as a "reality show" / "media release" client (read below). Call to discuss this if you have any questions before signing up as a "reality show" client. The Companies reserve the right to record any or all services delivered, for internal (non-public) use, so you're signing up as a private client has implicit in it, your agreement for yourself or someone you signed up, to be recorded. The Companies will seek your permission explicitly at a future time in the event that they want to use the footage publicly, or will use the footage with legally sufficient blurring of images to allow public release in a way not identifiable enough to require specific consent to use publicly. If you are interested in receiving discounts on your session time net of travel expenses, read below and consider being a "Reality Show" /"Media Release" Client); call us to discuss if you have questions about this. If any service you'd like is not presently offered as a service, you can request it be added. We offer substantially discounted and/or free services (usually net of travel time expenses if any) to those who agree to offer to the Companies a total media release - full rights to the Companies for use of all recordings of the events of the sessions (video "footage"/ audio/ written and spoken references to events therein) in any form, publicly, such as but not limited to a TV show, film such as documentary, online video, at events, on DVD or other recordings for public viewing, books/blogs or and any other publishing or media. You understand that the Companies are seeking to create one or more reality shows and series of web-based informational videos, so being a "reality show" client means you are agreeing to these and any other public forum those recorded media are presented, in any form. You will receive no further remuneration from use of the footage past the discounts on the services you receive(d). You agree to sign any written additional contracts re-confirming total transfer of rights and release to use the footage to the Companies as per this agreement presented to you by the Companies at any future time. You agree that if you do not follow through on this request within 7 days of receipt of the request, you will be deemed to have agreed to and signed those contracts restating this total release, and will assign the Companies rights to the footage including right to sign on your behalf on that and future agreements regarding use of the footage. Signing any subsequent, substantially similar written or recorded agreement will in no way reduce the commitment to fully release the footage made when booking your session. A Better Brain Equals a Better Life! What could you do if your brain was smarter, faster, better-connected and more aware? The answer is you could be or do "better" at almost anything (or everything)! Your brain is sensing, feeling, thinking, moving, and making decisions, every moment of every day, so even slight improvements in your brain's performance are noticeable, pleasurable, and over time, can transform your life! Our talk- or movement-based methods, which we collectively call "Mind-Movement(TM)", help your brain create bursts of new connections (aka "Neuroplasticity") that upgrade its ability to function better. This makes having a "better" life - however you'd define that - possible, since a more capable brain is now in charge. Our methods help "raise all ships", whether someone is underperforming, a high achiever, or in the middle. Mind-Movement(TM) methods help you become more of who you were always meant to be: more happier more "comfortable in your own skin", and more clear on and successful at what you were always meant do, given your current situation. Obviously we can't recreate lost limbs or give you back years lost to disability, but can help you function better in your current situation going forward, which is all we can do! Your brain holds onto patterns that define you over time, from how you run, to whether and how you decide to love somebody or ask for a raise, with resulting patterns of success or injury. These patterns may also keep you in a fog and unable to make decisions easily, leading to avoidance and procrastination (such as based on habits of lack of self-awareness, beliefs you aren't supposed to decide for yourself, that you can't come to decision, or inner conflict, or other reasons). These patterns make living the life you've already got easier, but changing to a different, better life, harder. The stability of patterns stored in your brain, including avoidance and lack of decision, tends to limit us as even conditions change that make these habits clearly detrimental, even very painful. Perhaps not being sure about yourself worked and avoided conflict with your family or friends at some point, but leaves you feeling disconected, and less effective, stuck and unclear in your life now. Perhaps "standing up straight" was something people encouraged at one time, but it's causing chronic tension and back pain, now. Our mental and physical patterns are based on past decisions that worked at some point, we've all but forgotten when, but perhaps are now outdated, but brains are wired to repeat what worked, and avoid looking or change, unless forced, and usually then with great discomfort and difficulty. It's surprising we are not born with a natural propensity for, or ability to review and revise past decisions, despite the obvious suffering these patterns cause. Up until their early 20's people are designed upgrades automatically and easily (assuming no major trauma or disability), but afterward we need an intentional process to improve ourselves mentally and physically. We Provide Those Mental/Physical Tune-ups! 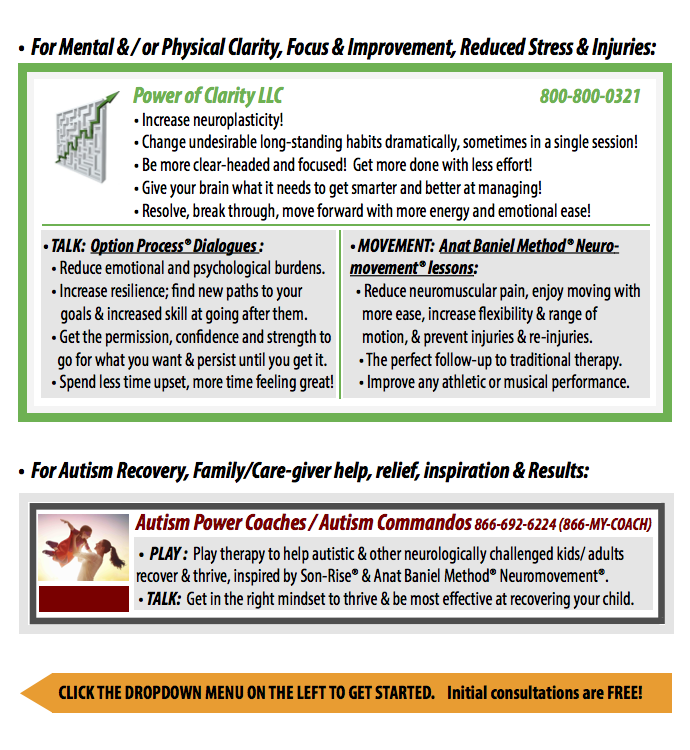 The Power of Clarity® LLC and Autism Power Coaches LLC (DBA Autism Commandos(TM)) provide the next best thing: methods to intentionally revisit, refresh, and update your mental and/or physical patterns. Our Mind-Movement(TM) methods are a safe, nurturing, pleasurable guided experience with our nonjudgmental coaches. We operate in your zone of comfort (physically, emotionally and mentally), seeking to gently invite you to expand your comfort zone only where you seem to want to change. Our coaches invite and empower you to break out of ingrained patterns, helping you find satisfying self-defining clarity and new patterns that work for you better, mentally and physically. If you're unclear we help you get clear - it feels great! Our sessions start with you feeling heard, accepted, and invited to be who you really are, which makes you feel more comfortable tuning into and creating resonance with who you were meant to be in your career or personal life. We provide the foundation for you to be stronger, enlivened, and raise the level of your best! Your improved experience, abilities, feeling of connection to yourself and others, start now! Call to discuss whatever is on your mind to sharpen your perspective. Our services are nonjudgmental, accepting, and done within your zone of comfort. We hope our services will form a life-long platform of connection, support and "improvement engine" in your life. We hope you'll come here whenever you have a problem or just want to talk! We are here as guides and coaches, to help you feel better, be more flexible and resilient, be more inwardly harmonious and comfortable "in your own skin", help find your ways around past, present or future challenges, help you strategize to achieve more success, find more enjoyment and energy in of any aspect of your life, emotional, mental or physical. We help reduce inner conflict and noise in your brain so you can focus and move forward better wherever that leads you. Changes and plans you've avoided or failed at in the past may suddenly seem doable with an upgraded brain. Difficult challenges may increasingly crumble into doable steps spontaneously, whether you are linearizing them in our Clarity Coaching, or if you've done Neuromovement® lessons that increased your mental networks on which to subconsciously figure things out. Everyone Can Benefit, including You! ANYONE and EVERYONE can benefit from our services, including you! It's not a question of whether, but how. A brain that moves better, thinks better, and vice versa, since it's the same brain doing both. Our processes have something to offer you whether you are a high achiever, and under-achiever, or in the middle. Are you living up to your potential? We could help you get there. We help slow-developing people (such as developmentally delayed children) develop faster, and older people feel and act younger, and seriously injured people progress past where traditional physical therapy left them. Given more physical movement choices the brain will often move differently. Have you ever had an "aha" moment and wondered why you didn't think of that days, months or years ago? We help you have more "aha" moments (don't those feel great?) sooner and with more intentionality, saving you work, headaches or heartaches, and time. We provide your brain more options from which to choose, as if you were young and rechoosing your path again, from a wiser place. Given more choices, our brains will make better choices, resulting in more ability and success, and less injury. Brains upgrade themselves and the function of the body they're in if given the proper environment. Talk: Talking with our coaches work best when you - or whoever you're booking sessions for - wants to talk through something (minors are welcome if their parents book the session). People who are not fully conversational or don't want to explore their issue would benefit most from movement lessons, that may cause spontaneous insight or shifts in thinking. Movement: Movement lessons can help people of any age or functional level, from newborns to elderly, highest performers and achievers to those who have mental or physical problems due to difficult experiences, injuries, medical challenges or developmenal delays; even those who are asleep or unconscious can benefit, since no intentional responsiveness is required. Autism: Our autism play therapy can work with any level of autism, even the most severe. Remote, talk-based services are available from anywhere by phone or internet. In-person services are provided through this system in areas within a few hours of Milwaukee, WI (zip code 53202), and all locations must be pre-approved; travel charges apply. In-person sessions available in the US and Canada such as San Francisco Bay area, Illinois, Michigan, Ohio, etc., periodically and by special arrangement - contact us at help@autismpowercoaches.com or 866-MY-COACH (866-692-6224) for more info. We warned you we'd keep reminding you! We believe our services are so helpful we don't mind reminding you to try them over and over again. They really are that good! Few things in life do what our sessions do, and we'd hate for you to miss a chance to taste the delicious feeling of neuroplasticity making your dreams come true! Select "Power of Clarity LLC" from the dropdown at the left for all services except autism play therapy home visits or consultations. Click here to return to www.PowerofClarity.com, AutismPowerCoaches.com, or AutismCommandos.com. Judge yourself less and feel better about your life! People wanting to change negative patterns of behavior such as addictions and habits in a way that deals more with underlying causes and patterns that sustain the habits, in a positive way that goes with their system rather than pitting them against themselves in a losing fight with "willpower" and self-judgment. People who want their child (and themselves) to be enjoy their lives and relationship while also helping that child recover. People who want their full recovery for their child(ren) from autism and believe (or want to believe) that is possible - we can help you get there. Call us if you have any questions at the 800-800-0321 (Power of Clarity), 866-692-6224 (Autism Power Coaches), or 888-888-4744 if you're not sure which company to select. And thank you for reading all the way to the bottom of the page! We were hoping you'd be that drawn in, and hope you've enjoyed, learned, and hopefully will trust us with your business, today.